I really had hoped that I wouldn’t have to write a post like this again. It had been well over a year since I could recall Don Mattingly ordering a sacrifice bunt in a situation that absolutely didn’t call for it. Specifically, the last one I could truly remember was Andre Ethier, ordered to move Dee Gordon (DEE GORDON!) over to second base- and in a game that the Dodgers were losing! These days, sacrifice bunting is a controversial strategy in MOST baseball circles, to put it mildly, especially among the sabermetric community. While I take issue with that group in many respects- wait until my upcoming Moneyball-related post- I’m pretty much with them on this one. Even so, there are at least a few situations where I can tolerate a sacrifice bunt from someone with a batting average higher than .180. For the Dodgers, Sunday’s extra inning heartbreaker in Queens, New York was not one of those times. This wasn’t even the end of it, though. The next batter up was Joc Pederson, a man who currently specializes in three things- walks, home runs, and especially and unfortunately, strikeouts. None of these things are conducive to a “productive out”, the only type of outcome that even REMOTELY justifies sacrifice bunting. Going for a one run inning on the road in extra innings is bad enough. Doing so on a 3-1 count? Even worse. Doing so with a guy who, under the circumstances, is more likely to produce an at-bat which will produce anything BUT one run? Inexcusable, particularly for a manager who has been given the occasional nickname “Buntingly”, and supposedly improved his strategic acumen (or at least, surrounded himself with better people). I have defended “Donnie Baseball” many times, holding onto the belief that his skills in dealing with personnel are more important than his occasional head scratching in-game decisions. He often gets too much of the blame when his star players come up short, or his front office does not give him the best players to work with. But this is not one of those times. Joc Pederson exploded onto the seen, showed a lot of promise, and already does some things very impressively. But it has become increasingly that against good pitching, he is often overmatched. In this at-bat, Pederson ultimately did what he does more than anything else- he struck out, and the Dodgers would ultimately strand Rollins on third base. This is not to give the young Dodger centerfielder a lot of grief- just his manager. As for the rest of the game, it was all too predictable from that point. The Mets would win on a walk-off in the bottom of the inning. 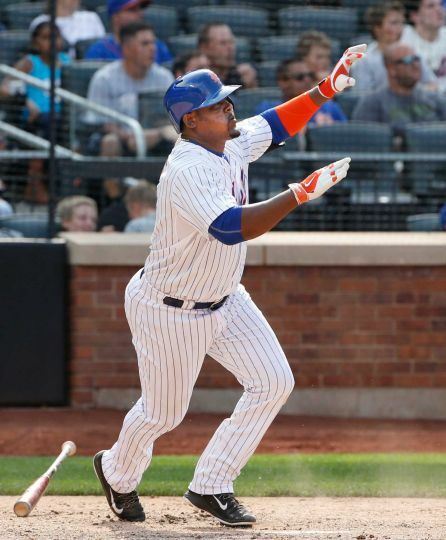 Adding insult to injury, the winning hit was delivered by Juan Uribe, of all people. Dodger fans will always remember Uribe fondly for hitting one of the greatest post-1988 home runs in team history, against the Atlanta Braves, in the 2013 NLDS. How did it happen? Uribe failed to get the sacrifice bunt down- twice, no less- at which point Mattingly called off the bunt sign in the nick of time, setting the stage for Uribe to play hero. It seemed that perhaps the Dodger skipper had seen the light, going so far as questioning why he had put the bunt on in the first place. That self-doubt didn’t last a single game, as he employed it against the Cardinals in extra innings during the next round. (The Dodgers didn’t score then, either, and ultimately lost the game.) And here we are now, nearly two years later, having the same scenario play out right in front of us. It’s all too predictable, and tiring to talk about. And if Juan Uribe’s presence wasn’t enough to show Mattingly the fallacy of this, chances are that nothing will. The Dodgers and their fans should just hope that they are not even presented with such a situation in mid-October, should they be so lucky to make it that far. All is not lost, though, as the Dodgers have managed to hold onto first place, heading back to Los Angeles. (Barely, but they have.) The always streaky Giants have streaked the wrong way lately, from a “blue” point of view, thanks in part to the Oakland A’s, waving the green, yellow and white flag of surrender. And now the Dodgers face that same pitiful team, hopefully with the same results as the archrivals. The Moneyball post can’t come soon enough. I’d better get started on it.